In the modern world of professional cooking, and even for home cooking, it is hard to imagine working in the kitchen without at least one good paring knife. 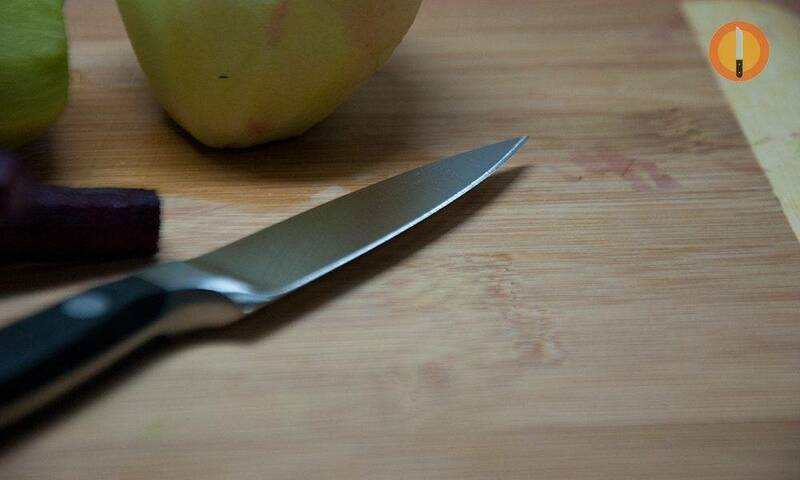 Many people get confused as to what a paring knife actually is. There are many models that call themselves paring knives, when they are actually a form of utility or specialty knife. There are many jobs that can be done equally well with either a paring or utility knife, but some jobs will come out better with a real paring knife. A true paring knife is a specific design and size. 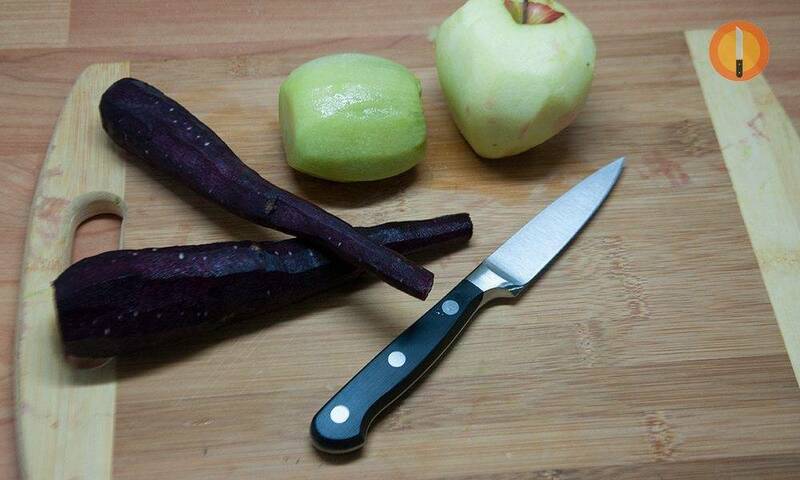 My Wusthof paring knife: great for peeling fruit and cutting small vegetables. If I had to choose one paring knife to have, I’d choose the Wusthof Classic 3-1/2-inch Paring Knife without thinking twice. It’s reasonably priced and suitable for a wide range of tasks in the kitchen. 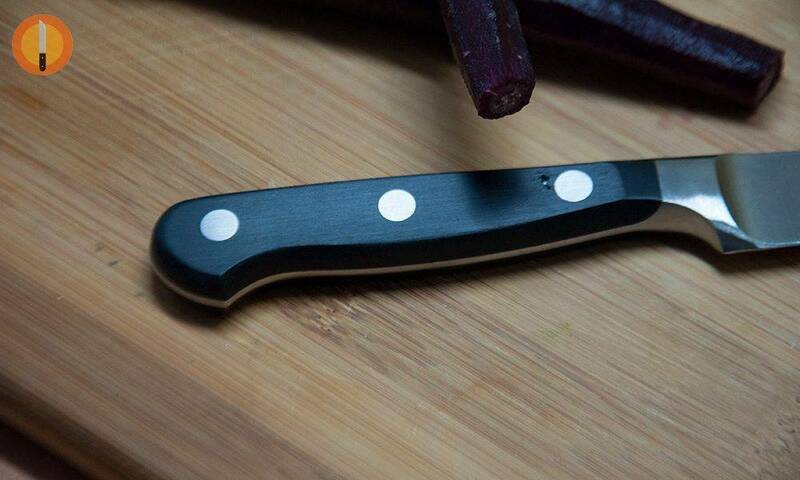 The blade is made of forged high carbon stainless steel and the handle is triple riveted. The blade is really sharp and easy to maintain. What do I use my Wusthof paring knife for? It’s small, light and suitable for small cutting jobs. I cut and peel fruit all the time with it, mince herbs, fillet small fish. I also use it as a steak knife sometimes. Given its small size, it’s very versatile and gives me outstanding control and comfort. It’s my knife of choice when I need to have precise cuts or shapes. The triple riveted handle is well-balanced: not too light, not too heavy. It also and fits my hand comfortably. The handle is very comfortable, light and well balanced. All in all, this is a great paring knife for the money, holds the edge really well and cuts through veggies and fruit like butter. 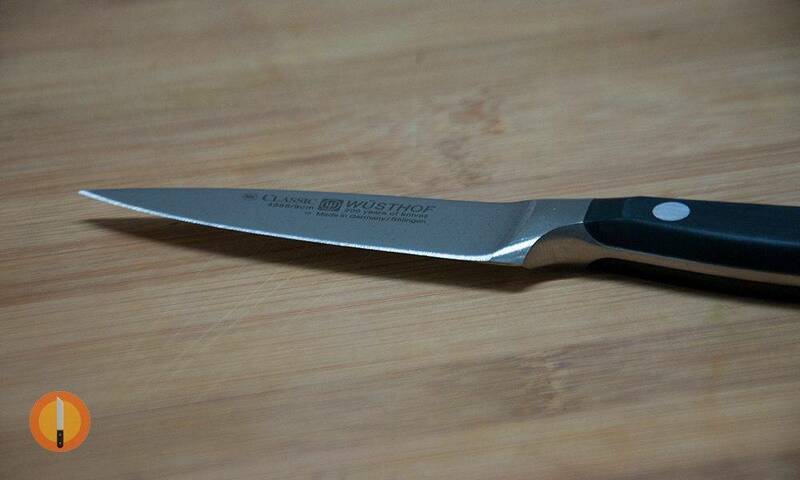 KnifePlanet’s Video Review of the Wusthof Paring Knife. 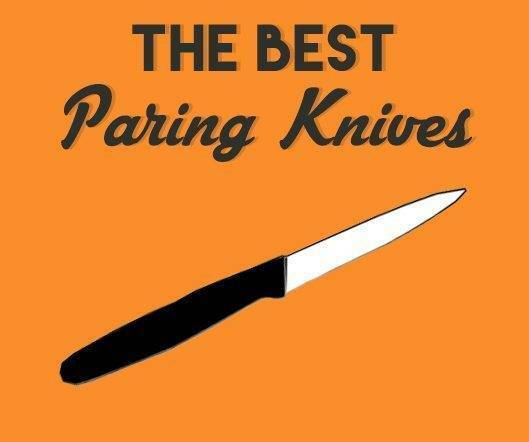 . .
WHY CHOOSE A PARING KNIFE? The main difference between a utility knife and a paring knife is size. A paring knife blade is 4” or less, while a utility knife can be as long as 6”. While there are a few different styles of paring knives, they all have a few things in common other than blade length. They will all be some sort of drop point blade with a non-serrated edge. They can be made from high-carbon steel, stainless steel, or even ceramic. The handle is designed to give you a good solid hammer grip, which is in the fist with the blade facing up and away. This allows you to use your thumb, or index finger on the spine of the blade as a precision guide, and to apply a little more force when needed. The blade is directed by the wrist. On chef’s and utility knives, the blade is directed more by the heel of the hand. There are a few specialty designs that can be considered paring knives as well. One of the most popular is the Hawksbill style. It is used for coring and peeling mostly, and especially for making decorative cuts such as vegetable sculptures. It is also great for sectioning citrus fruits like grapefruit, oranges, lemons and limes. Another popular style of paring knife is the Finnish Pukku. 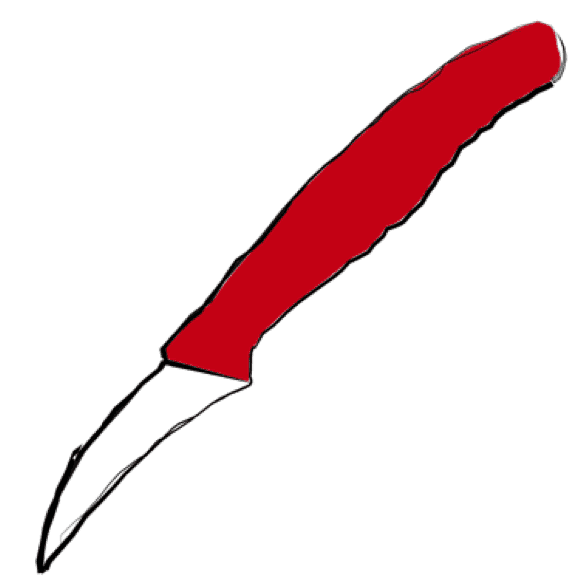 The Pukku is a small knife used by Nordic and Scandinavian indigenous people for just about everything, from trimming seal fat to thinly slicing root vegetables. Its history goes back over 1000 years to the Sami people of the Finnish Laplands. Its been around for a long time because it works. The unique square-shaped handle offers a good grip even when your hands are wet, and it would be hard for the blade to twist while you are using it. A pukku can slice tomatoes so thin you can see through them, and saw through chicken bones like hot butter, when properly maintained. Cold Steel makes an excellent modern version of the Pukku called the Finn Bear, and Mora also makes a great line of modernized Pukkus. These are super versatile and of very high quality. They are also very reasonably priced. If for some reason you are limited to the number of knives you can keep, a Pukku is definitely one you want to have. Our Stone Age ancestors made extensive use of the flint and obsidian hand axe, which was their version of the Swiss Army Knife. It could cut, skin, scrape, and gouge. At some point, an enterprising individual reasoned that a pointed tip, a thinner edge, and a gripping section made from wood, bone, or wrapped leather would be more useful. Due to the nature of flint and obsid-ian, larger blades would break easier, so the blades were made short, and very utilitarian. You could say that the first true knives were actually paring knives, and that is what they were used for most of the time. Knives were never considered as a weapon until much later, during the Bronze Age. Modern paring knives evolved in 16th century France from an older tool called an acouteau à parer, used to thin the edges of leather sheets used in book bindings. Professional cooks quickly discovered the blade was extremely useful for a lot of kitchen tasks, and with a little modification, the modern paring knife was born. The introduction of the paring knife made many new kitchen jobs possible that would be difficult (but not necessarily impossible…) to do with a Japanese chef’s knife, such as vegetable sculpting, precision peeling and cutting, coring, etc… In the modern world of professional cooking, and even for home cooking, it is hard to imagine working in the kitchen without at least one good paring knife. Of course, any paring knife, no matter how much you pay for it, is only good if it is taken care of and used properly. You should keep them as sharp as possible, and never, never just throw them in a drawer. They will bang up against hard stainless steel knives, forks, spoons, etc…and the edge will be damaged. Paring knives are best stored in a knife block, or at least in a sheath in their own compartment in a drawer. 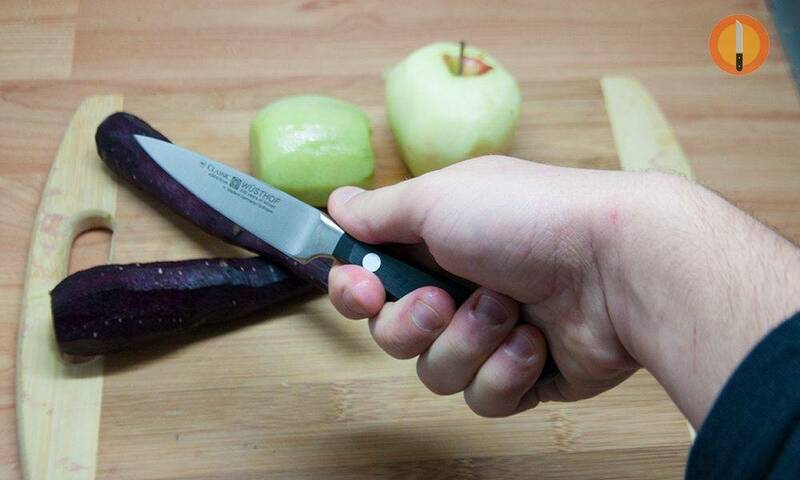 Keep the blade lubricated with vegetable oil, but not olive oil, which has a lot of corrosive natural salt in it. And never use any animal fats, for the same reason. Use canola, vegetable or corn oil. Just smear a light coat on the blade after sharpening it, let it set for a few minutes, then wipe the excess off, leaving a very thin film on the blade. Anytime the scales get cracked, discard them and make a new set, or get a new knife. Never use a knife with a cracked handle. Also, although many people do it, I discourage putting your good kitchen knives into the dishwasher. The high heat can damage some scale materials, and it’s not a good idea to let your knives set around wet. They are also small enough to get lost in the workings of the machine, which can damage both the knife, and the dishwasher. They are best cleaned by hand, as soon as you are through with them. Then give them a few swipes on a rod, a little oil on the blade, and put them up. 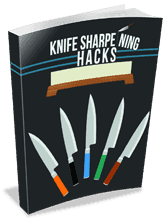 It only takes a few minutes, and will keep your paring knives in top shelf for years and years. As always, when selecting any kind of knife, don’t skimp. This is one area where your money will pay off in the long-run. Cheap, shoddy knives (of which the market is flooded with) will end up costing you all kinds of grief later on. Stay with name brands and proven designs. A good paring knife can last several lifetimes. Check back with us often. In the future, we will have more great in-depth articles on different kitchen knives, and how best to use them.